The next step in our examination of regionalism in Quebec literature is Maria Chapdelaine. I have published a short post on Maria Chapdelaine, a novel written by Louis Hémon (12 October 1880 – 8 July 1913), a Frenchman born in Brest. After studying law and oriental languages at the Sorbonne, Hémon moved to London and, in 1911, to Quebec, Canada. 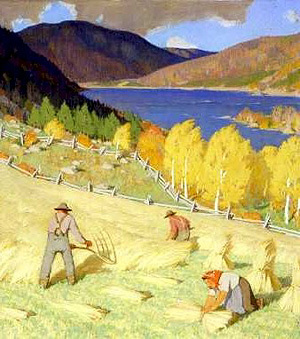 In 1912, he spent several months working with cultivateurs, or farmers, in the Saguenay-Lac-Saint-Jean area, up the beautiful Saguenay River. He lived in a community called Péribonka and spent the winter of 1912-1913 in that community, writing his novel. The plot is simple. But, although Maria Chapdelaine is a roman du terroir, it differs substantially from Patrice Lacombe’s La Terre paternelle and from Pierre-Joseph-Olivier Chauveau’s Charles Guérin. Louis Hémon did not feel dispossessed of his ancestral land and betrayed. And he had not transformed the insurrections of 1837-1838 into an ethnic conflict, which they were not, at least initially. 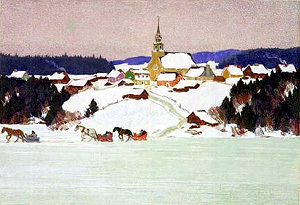 The artwork featured in this post are illustrations for Maria Chapdelaine, executed by Clarence Gagnon and housed at the McMichael Museum, in Kleinburg, Ontario. However, Hémon worked with men like Maria Chapdelaine’s father, Samuel Chapdelaine a name not coincidentally resembling that of the Father of New France, Samuel de Champlain. These otherwise unemployed men were trying to transform rebellious soil into arable land. They had gone north, as the colourful curé Labelle (24 November 1833 – 4 January 1891) advocated, and were “making land” (faire de la terre). [ii] Father Labelle preached “colonisation.” That was the “patriotic” alternative to leaving for the New England states. As indicated in my post, Hémon gives Maria Chapdelaine three suitors: François Paradis, Lorenzo Surprenant and Eutrope Gagnon. 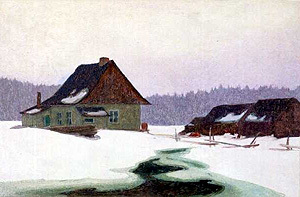 François dies in a snow storm, which was to be expected. In traditional Quebec society, happiness was viewed not only as impossible, but as dangerous. Lorenzo Surprenant has come north to find a wife and take her down to the United States, but Maria turns him down. She will marry a neighbour, Eutrope Gagnon, and live as her mother lived. The names of the suitors are revealing: Paradis is paradise, Surprenant, surprizing, and Gagnon, close to the verb gagner: to win. Hémon’s novel is somewhat stylised. Maria Chapdelaine also differs from La Terre paternelle and Charles Guérin in that, unlike Chauveau’s Charles Guérin, it does not feature an ‘ugly’ Englishman: Mr Wagnaër. As for La Terre paternelle, although the novel does not feature an explicit ‘ugly’ Englishman, Jean Chauvin fails where an Englishman would have succeeded. I believe this is the reason why Lacombe views cities as unhealthy. Our next regionalistic novel is Father Félix-Antoine Savard‘s (August 31, 1896 – August 24, 1982) Menaud maître-draveur, 1937 (translated as Boss of the River, or Master of the River by Alan Sullivan (1947). It earned Savard a Medal from the French Academy. [i] 1934: Maria Chapdelaine, directed by Jean Duvivier, starring Madeleine Renaud and Jean Gabin (France); 1950: The Naked Heart, directed by Marc Allégret, starring Michèle Morgan (France); 1984, Maria Chapdelaine, directed by Gilles Carle, starring Carole Laure (Québec). 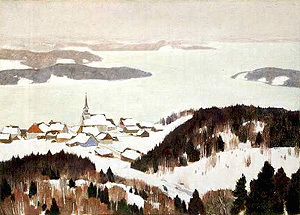 [ii] Curé Labelle, a legendary figure, is featured in Claude-Henri Grignon’s (Sainte-Adèle, 8 July 1894 – Québec, 3 April 1976) novel Un homme et son péché (1933). 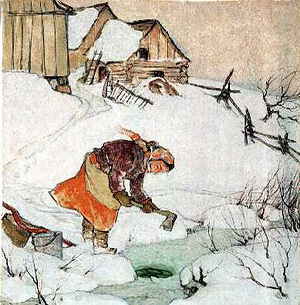 Grignon’s novel was transformed into a very popular serialized radio and television drama. A film adaptation, entitled Séraphin: Un homme et son péché, Séraphin: Heart of Stone, was released in 2003, but it had been filmed in 1949. Séraphin is a miser and he is cruel to his wife Donalda.